Singer and songwriter Ela Wardi’s sound is a mix of Pop/Soul and Electro and her lyrics are steeped in the journey of life. In 2004, Ela Wardi came to New York City to find new inspiration for her music. After she won the "International Newcomer Festival" she decided to stay in New York City for three more years, before moving back to Germany, where she began working with Stefan Gruenwald from Clubland Records. There they produced a cover version of the classic house anthem "Hold On Tighter To Love". House/Electro was always a part of Ela’s musical life. In Germany, Ela also worked with well-known DJs Jean-Claude Ades (JCA), as well as Milk and Sugar. Her follow up single covered the Yazoo classic “Don’t Go” and featured Stefan Gruenwald vs. Jerry Ropero. 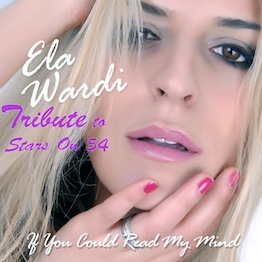 Ela’s next single was a cover version of the classic “If You Could Read My Mind” signed to Next Plateau Entertainment in North America.